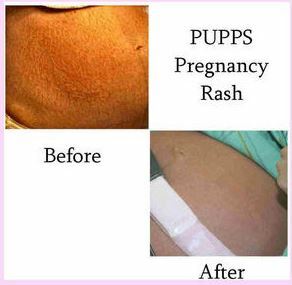 1 What is puppp rash? PUPPP refers to Pruritic Urticarial Papules and Plaques of Pregnancy. Pregnant women often experienced this unique skin rash. The onset of the PUPPP is more common at last trimester, but there is a possibility of the occurrence at any stage. The different countries denoted this with various names which include Polymorphic Eruption of Pregnancy (PEP), specifically used this term in the United Kingdom. PUPPP is also named as toxemic rash of pregnancy, toxic erythema of pregnancy and late-onset prurigo of pregnancy. The prevalence of the development of PUPPP is more common in first time pregnancy and different surveys are reported that the probability of incidence rate is 0.5%. Though the symptoms are not fatal for both the mother and her baby, but it provides too much uneasiness and depending upon the patient discomfort, gynaecologists even suggest initiating the labor before one week of the usual duration (at 39 weeks). Usually after delivery within a week, the symptoms disappear, rarely sustained for a longer period and may be due to retention of the placental product. There is a negligence chance of recurrence with subsequent pregnancy or by using of oral contraceptives. PUPPP rash does not appear on the palms, soles and face. PUPPP rash is intensely pruritic, rarely excoriations. Pale colour is developed at the surrounded part of the papules. Rarely extended to the breast. Multiple gestation pregnancies, the risk are higher for triplet over twin due to stretching of the abdominal skin is much more. Increased maternal weight gain due to maximum skin expansion. Wight of the baby is more than the normal. Topical application of emollients, preferably Aloe Vera and oat preparation, which provide cooling sensation. Other than these local application of moisturizing lotion and aqueous based ointments are also beneficial. Topical application of corticosteroid ointments or creams which contain less quantity of prednisone or hydrocortisone. Anti-allergic tablets which restrict the release of histamine by stabilizing the mast cells. These tablets include cetrizine and many more and have fewer side effects in the foetus in the last trimester. Very rarely doctor prescribed oral corticosteroid for very severe cases which cannot be controlled by other medications, as systemic absorption of corticosteroid has several side effects which may hamper child growth. Though the chances of adverse events are less as in last trimester child’s bone development almost completed.